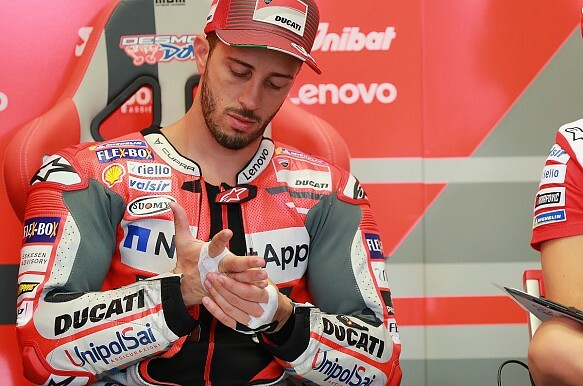 Ducati's Andrea Dovizioso set the pace in the opening MotoGP practice session at Misano, as both Marc Marquez and Valentino Rossi were outside the top 10. Dovizioso led in the early stages of the 45-minute session, but he was demoted by both the Yamaha of Maverick Vinales and Honda's Marquez at the halfway mark. Marquez's top time of 1m33.406s was then smashed by Jorge Lorenzo with seven minutes remaining, the Ducati rider going eighth tenths of a second faster. Lorenzo's lead was shortlived, with his team-mate Dovizioso moving ahead thanks to two consecutive 1m32.6s laps. He topped the session by 0.101s from LCR Honda's Cal Crutchlow, the Briton edging Vinales out by three hundredths. Lorenzo ended up fourth, followed by Suzuki's Andrea Iannone and Pramac Ducati rider Jack Miller, who crashed at Turn 1 as the chequered flag fell. Dani Pedrosa was six tenths off the pace in seventh on the best of the works Hondas, ahead of Johann Zarco's Tech3 Yamaha and Danilo Petrucci's Pramac Ducati. Marc VDS Honda rider Franco Morbidelli impressed in 10th as both Marquez and Rossi did not switch to a fresh soft rear tyre in the end of the session and ended up only 13th and 15th respectively. Ducati wildcard Michele Pirro, making his first MotoGP outing since his horror crash at Mugello on board a fourth GP18, was 16th, while Honda tester Stefan Bradl was 20th-fastest. Pol Espargaro, returning from the injuries he sustained last month at Brno, was 21st, four tenths slower than KTM team-mate Bradley Smith. Xavier Simeon, riding the injured Tito Rabat's Avintia Ducati GP17, was 23rd, with his own replacement Christophe Ponsson ending the session last, 7.4s off the pace - missing the 107% cutoff by a full second. Hafizh Syahrin had a crash at the long Turn 10 right-hander and was 25th, only ahead of Ponsson.